HUNTINGTON, WV (HNN) - With the Martin Luther King holiday expect a little schedule manipulation. Some cinemas offer matinees on Monday. Next Up, (Jan 21) The Company Men, No Strings Attached, The Way Back; (Jan 28) The Mechanic; The Rite; From Prada to Nada; (Feb 4) , Sanctum, The Roommate. 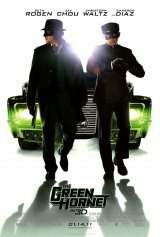 GREAT ESCAPE 12, Green Hornet 3D, 1:30-4:20-7:10-10:00; Dilemma, 12:30-3:20-6:55-9:30; Continuing Digital 3D, Tron , 12:20-3:15-6:35-9:25; Gulliver’s Travels, 2:30-7:00; Yogi Bear, 12:35-2:40-4:45-7:05-9:10; TIME CHANGES: None; Ends Thursday: None.